As the evenings turn colder, our thoughts turn to the delicious recipes we’ve put aside all spring and summer. Some of our fall favorites have ingredients that come straight from the garden, including Butternut Squash Soup and Shepherd’s Pie. Share your favorite fall recipes with us on Facebook – and let us know if you try these! Cut squash into bite-size squares and coat with butter, salt and pepper. Put in the oven at 400 degrees for 30-45 minutes. While the squash is roasting, sautée onions, then add to broth and water. Bring to a boil. Add squash, breaking any remaining chunks as you stir. Fold in heavy cream, then season lightly with nutmeg and cinnamon (optional). Place in a blender to puree, but remove the center cap from the lid of the blender and replace with a towel so that steam can escape. Serve with a sage garnish. Prepare stew in the crockpot using Emiril’s recipe. 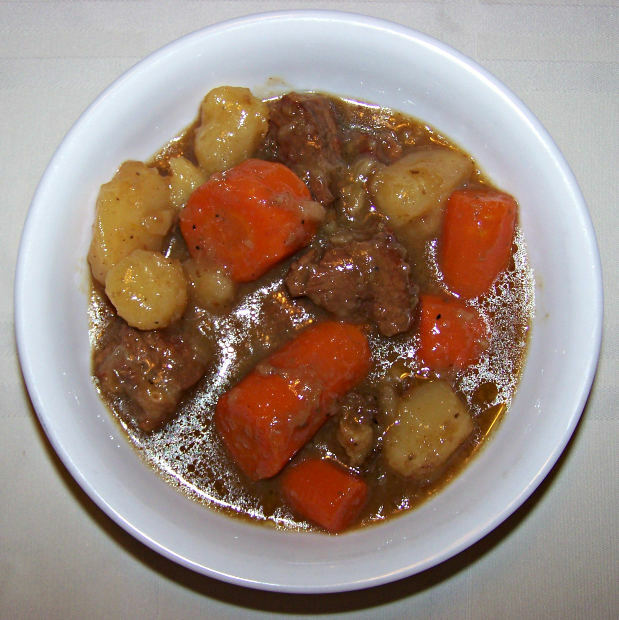 This stew is fabulous on its own, so use leftover stew to make the shepherd’s pie. Harvest potatoes from your garden to make mashed potatoes.Put stew in a baking dish, cover with a thick layer of mashed potatoes. Place in the oven for 40 minutes at 325, then pull and add a layer of shredded sharp cheddar cheese. Return to the oven for ten minutes or until the cheese melts. This all-in-one meal is perfect for a chilly fall night. September is a wonderful time of year for gardening. Not only are you enjoying the fruits (and veggies) of your summer labors, but fall gourds and sweet corn start making an appearance on dinner plates and fall flowers begin to brighten your garden space with new colors. From sunflowers to zuchini and squash to the bright orange promise of future Jack-o-Lanterns, September gardening can be a delicious and beautiful treat. September is also the perfect time to begin preparing your garden space for winter. As you gather the last of your harvest, you can begin to gather material to add to your compost. It is also a great time to prine back Spring blooms, corn stalks, and flowers. Dead head finished blooms from roses and other flowers as they end their bloom season. 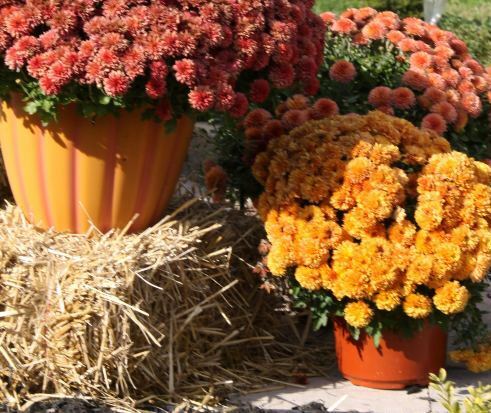 If you’re looking for something new to add to your flower garden, it’s the perfect time of year for mums. Be sure to give them plenty of space; they will not only come back each year but will get fairly large. With a variety of colors, thee plants add a velvety rich texture to any flower garden. There is just something about late harvest that reminds us of back to school, Thanksgiving, and Christmas. Whether it’s those last delectable ears of corn or the hint that the weather is about to change again, this later part of the season is certainly a time to be cherished. The Farmer’s Almanac is predicting yet another rough (cold and snowy) winter for much of the United States, so cherishing this last days of summer become even more important. This is a great time of year to start preparing for fall composting. From early falling leaves to late-season grass clippings to leftover vegetable garden material, you can begin collecting the nutrients you need to make a great compost bed. 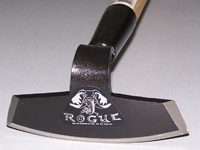 Our made-in-America gardening tools, like Rogue hoes and Bully Tools rakes and shovels, not only make it easier to create and maintain your compost but ship free from BarnyardProducts.com and come with a limited lifetime warranty. No matter what work you need to do for your late harvest, the garden and landscape tools at Barnyard Products help you get the job done easier. With free shipping, high quality American-made tools, and the best customer service around, you can’t go wrong. Come Say Hello! Barnyard Products Has a New Website! We’ve been working diligently on a new website for Barnyard Products to make the shopping experience even better for all of our customers. We hope you’ll drop by and have a look around. In fact, we’d love nothing more than for our dedicated readers and customers to poke around and help us make sure we didn’t miss any small details. You’ll see that shopping on the site is easier than ever, and the one thing that hasn’t changed is that we always offer free shipping and the products we carry at BarnyardProducts.com are American Made. Whether you need gardening and landscaping tools that will last a lifetime or you’re in search of the perfect wedding or housewarming gift, we have a huge selection of made-in-America products that ship free anywhere in the U.S.
From ag cams to hitches to drip irrigation kits, you can count on BarnyardProducts.com to be your one-stop shop for everything you need to landscape, garden, or celebrate. Right now, you can save $10 on flagpoles with the coupon code FLAG2014 or save $10 on any decorative windmill with the coupon code WIN2014. Come take a look around! We’d love your feedbacka and suggestions, too. Feel free to leave comments or suggest additional products you’d like us to carry. We’ve been discussing the need to plan your yard before you landscape. Last time, we discussed light, water, and animals. We continue the discussion this week by exploring space, color, and arrangement. One of the biggest issues homeowners end up having is more plants than space. It’s very easy to overestimate how much space you really have given the plant’s size at maturity. In fact, what often happens is that the landscaping plan is made based on what fits together when the items are planted, but if you’re not planning for the next 5-10 years of growth, you’ll often end up with more problems. As you plant, consider how much space you have based on the projected size, height, and root requirements of the mature plants. 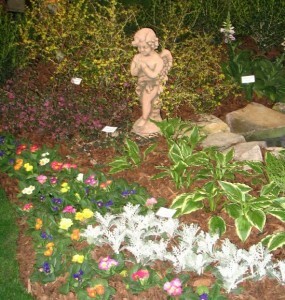 You can always use annuals to fill in the space you have to leave to accommodate the mature plants. 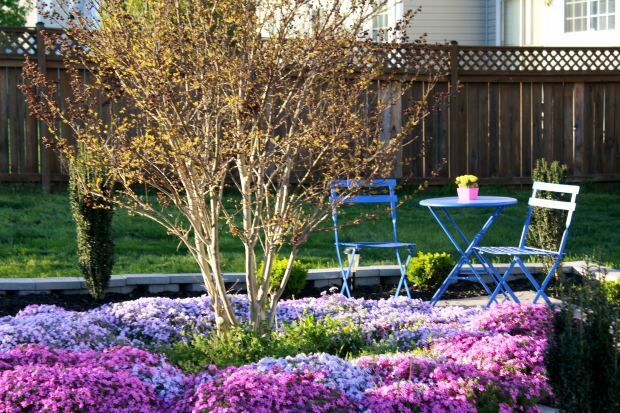 Both by choosing the color of your flowers to complement each other and by choosing a variety of plants that bloom at different times, you can create a landscape that is beautiful all year long. 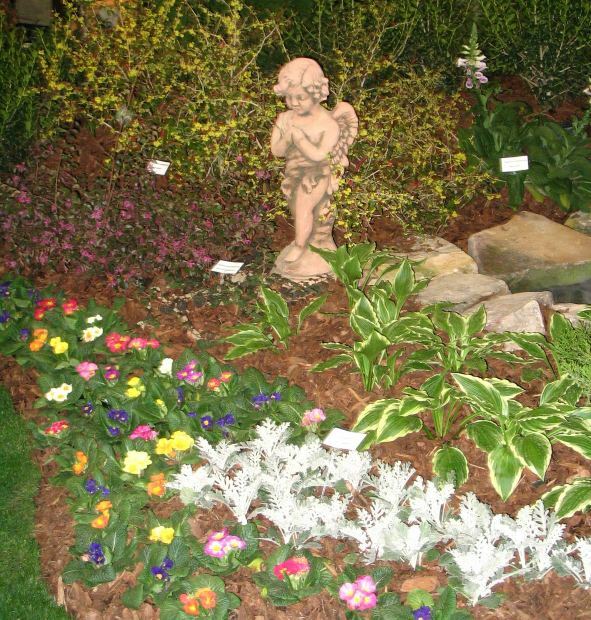 Consider different textures and shades of color to add depth and dynamic to your landscaping. When planning how to plant multiple plants in a group, again consider their size at maturity. Combine a variety of plants that will grow to different heights to create a visually appealing landscape, but consider how the growth of each plant will affect the others; if you’re now-sunny garden will soon be shady three quarters of the day from a large, fast-growing bush, you may want to reconsider what you plant. Have you had a landscaping success or disaster? Share your photos with us on Facebook! Have you ever seen a yard where it was obvious the landscapers didn’t plan for what the yard would look like in the years after planting? It’s important when you’re planting to consider not just how things fit together when they are newly planted but also how they will thrive together as they grow. In this post, we’ll discuss some of the basics you should consider when planting. In our next post, we’ll wrap up with some of the other considerations that help bring your landscaping plan together. How much light will the area receive? Observe how many hours of sun each part of your yard receives before choosing which plants should go in each location. Some plants will require full sun – more than six hours per day – and some will require very little sun. 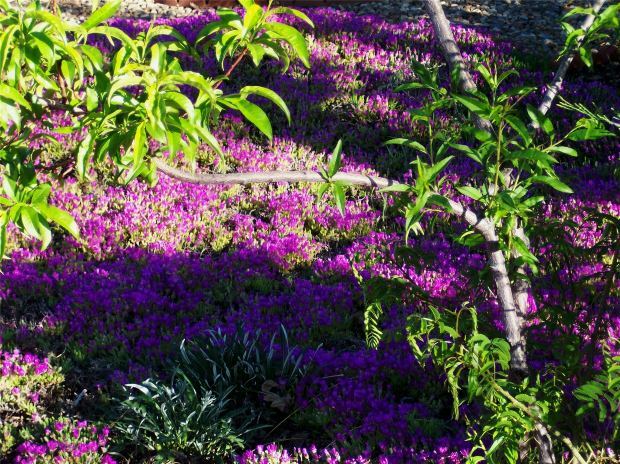 Identify shady parts of your yard and choose plants that thrive in less sunlight. Do you live in an area with a water shortage? Are you in a desert or drought area? Consider plants that require less water. The more you choose your plants based on the climate in which you live, the more likely they are to thrive. Are you in an area where you’re likely to get a lot of deer, or raccoon, or squirrel? 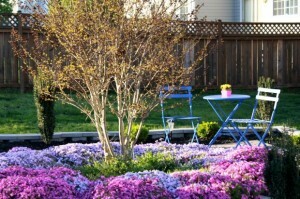 Take these visitors into consideration when planning your landscaping. If you need to deter deer, choose plants with spiky leaves or thorns. Landscaping is best done with a plan. Next time, we’ll explore color, space, and arrangement as factors in planning your landscape. If you only plant crocuses or tulips, you’ll only enjoy blooms for a month or two at best, and then it will be back to drab, green plants that are just a reminder of what once was (and a hint that you’re one step closer to another winter). To keep blooms fresh and lively in your garden all year, refer to this handy flower planting guide that will help you plan your garden so that as one set of blooms are wrapping up, another is just budding. Hibiscus These tall, striking flowers will bloom from spring until fall. They can grow up to eight feet tall, though, so keep that in mind when planting. Other multi-month bloomers include Globe Amaranth and Day Lilies. Choose a variety of crocus and grape hyacinths for the first-hint-of-spring blooms that bring us all hope the summer is on its way. Tulips, Daffodils, and some Iris varieties will bloom well in the late spring to early summer. 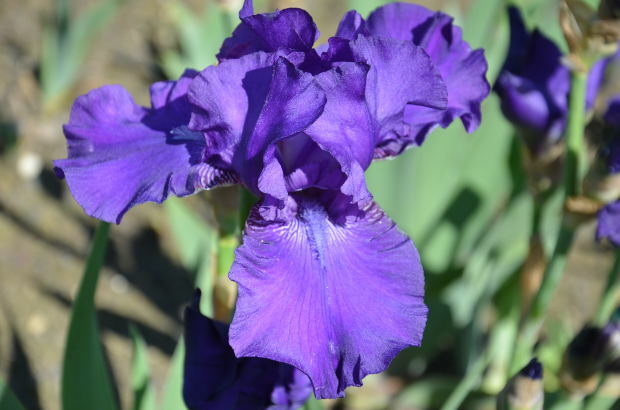 Bearded Iris, as well as Dahlias, Zinnias, and even wild flowers like Wild-Eyed Susans will do well during the hottest summer months. Add lovely color to any garden in the fall with Aster, Goldenrod, and Perennial Sunflowers. Some climates will also support beautiful Red Spider Lilies. In our area of the country, it gets too cold for much of anything to survive, including humans. Some areas, however, will continue to be able to grow hardier flowers such as poppies and peonies. Check out this list of the top winter plants to inspire even more landscaping creativity. The decimation of the bee population is no longer a question, and it’s not just honey bees but bumble bees, which are largely responsible for the pollination of tomato plants. Blamed on pesticides and pesticide residue being brought back to the hive, as well as viruses and parasites, the death of so many bees will be catastrophic to the environment. The fact is, humans cannot live without bees. What can you do to help? Thanks for asking – we have a few ideas. 1. Plant bee friendly flowers and plants. 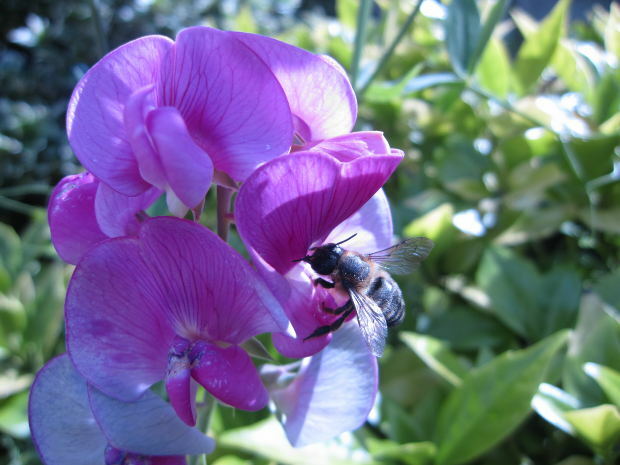 Every gardener and farmer can help promote healthy bee populations simply by planting a variety of pollen-producing plants and flowers. Weeds are good for bees too, so don’t be too quick to rid your yard of those dandelions. There are many plants honey bees love. Start with this list. While honey bees live in hives, other bees will use any kind of shelter they can find, such as dead trees and underground nests. To help wood-nesting bees, set out bee blocks. The best thing we can ALL do to help bees – and ourselves – is to stop using pesticides altogether. The delicate balance of the earth’s ecosystem and our own endocrine systems are being damaged by the residues these pesticides leave in plants that bees, animals and humans consume. If you’ve started planting, you are probably spending an inordinate amount of time watering gardens and doing your best to keep everything growing. Hopefully, you’ve benefitted from composting and the nutrient-rich soil it provides (and if not, it’s never too late to start). Another way to make it easier to keep things growing is to have the proper water delivery system in place. 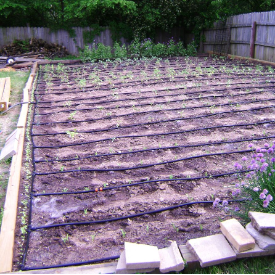 Using drip irrigation and timers that keep the water running even when you’re not there to hold the hose, you can overcome the time constraints that might be keeping you from having easy access to delicious veggies all summer long. Drip irrigation carries water directly to the base of each plant, so you lose less to evaporation. The slow drip delivers water slowly to the roots of the plants. Our drip irrigation kits are easily customizable and can be set up even by inexperienced gardeners Putting a drip system into your garden is a great do-it-yourself project that will ultimately save you time and help your plants grow. With all that extra time on your hands, you can get on to the next project. What’s next on your honey-do list? Whether you have five acres to play with or just a small apartment balcony, there are things you can do with your landscaping that allow you to create a place of escape. Imagine having a small corner where you can read, enjoy the warm weather or simply relax. For smaller spaces, consider adding a container garden. In containers, you can plant just about any fruit or veggie; potatoes, cucumbers and tomatoes all have miniature versions designed to be grown in containers and other small spaces. To add color, plant nasturtium, and if you’re not bothered by bees, add some lavender for a lovely aroma. Another item that is perfect for small spaces is a tabletop fountain. The sound of running water is extremely calming, and a small fountain can be the perfect addition to your balcony. If you have more room to work with, you can build a small pond or install a larger fountain. Simply add a comfortable chair to your landscaping, and you’re set! Surround yourself with your favorite floral fragrances, as well as fruits and veggies, using raised garden beds. If you’re trying to determine the perfect spot, consider a secluded corner that gets a bit of shade so you can enjoy it during hot afternoons. Save on your purchase of decorative windmills with code win2013, extended through 2014!